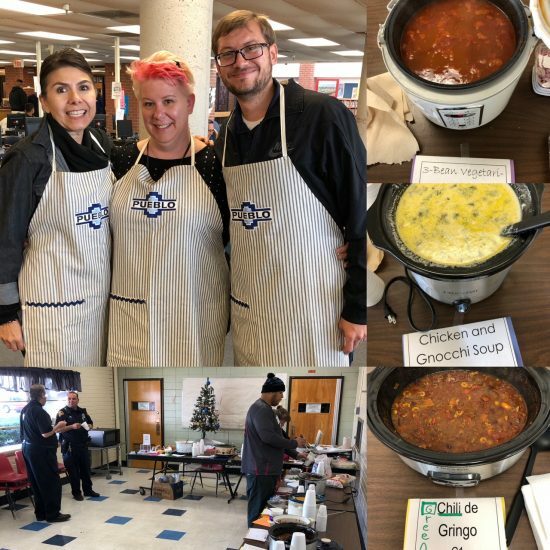 On Friday, Dec. 8, approximately 70 faculty members, staff and students turned a cook-off into a raffle contest where the chili, soup and stew were evaluated. Ms. Sarah Barnes, a Multi-Tier System of Support Facilitator, coordinated the event during first and second lunches. Tickets were one dollar—allowing one to be a “taster”. “This event was an excellent break from the grueling grind of teachers’ schedules and encourages the staff to enjoy one another,” Barnes said. Ms. Kathryn Gunnels, assistant principal, earned the blue ribbon—a first place for her chicken and gnocchi soup. Marketing teacher Dr. Maria Bicknell won second place for her three-bean vegetarian chili. Mr. Patrick Peatrowsky, economics teacher, won for his “green chili de gringo” creation. All three winners received a beautiful apron—from the crafty hands of Exceptional Education Department Chair Ms. Trevia Heath. She added, “There will be more competitions in the future.” Barnes said that she is considering having a salsa contest and a dessert competition. Barnes said that $70 was raised, and the money will go into a general fund for future staff celebrations. “For an event that I sold just six tickets in the beginning, I was very pleased with the end results,” Barnes said. Posted on December 11, 2017 December 22, 2017 Categories Around Campus, Cook Offs, Faculty, WinnersLeave a comment on Ready, Set… Cook!